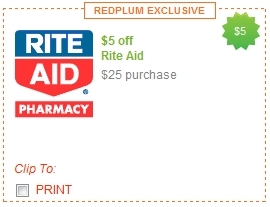 There is a $5 off $25 Rite Aid coupon available on Red Plum. I believe it’s available for most zip codes but you have to change the distance to 50 miles to see it. This coupon would come in handy for the great deals this week here and here.